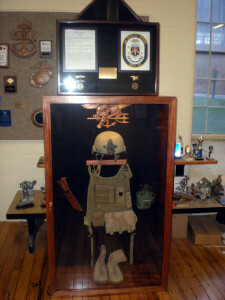 Order your Military Retirement Shadow Boxes Early. It’s never too early to start planing for your Military Retirement Ceremony. 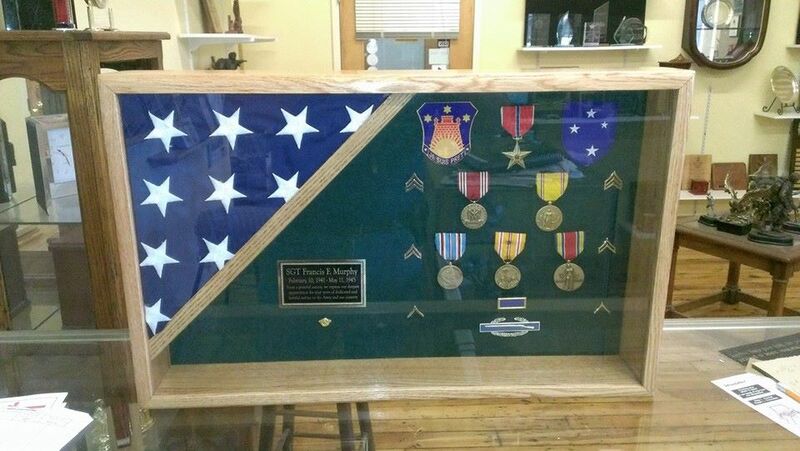 We have a full line of Military Shadow boxes, from Flag Displays to Elaborate Sea Chests. 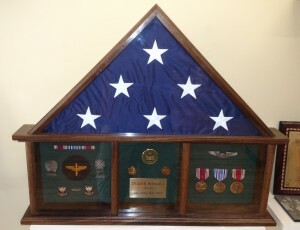 Most Military Retirement Shadow Boxes can be customized to your satisfaction. 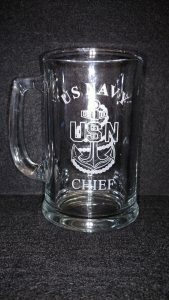 We have a full line of Military Retirement Gifts. See our website for Shadow Boxes at http://basementwoodworks.com/product-category/military-shadow-boxes/ and for gifts at http://basementwoodworks.com/product-category/personalized-gifts/ you can also see some of our catalogs at http://www.accolades4me.com/ We look forward to serving you. 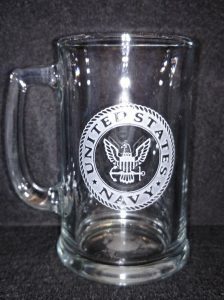 Engraved Military beer steins are perfect gift for any promotion or retirement. Deeply carved using our sand carving technique, each of our custom beer steins are meticulously custom made to order making it the perfect gift for beer lovers. These beer steins can also be personalized for an additional fee. Our beer steins hold 15 oz. and are dishwasher safe. Currently we have the NAVY Stein and the CHIEF Stein. I will soon have the SCPO and the MCPO Steins ready to go in the near future to be followed by many more. Our intent is to have at least one for each branch of service plus more. Please visit our personalized gifts page and select glassware to find the latest steins available. We also carry Pilsner and wine glasses too. The most common question we get each week is if we can build a custom shadow box or modify one we already have. The answer is yes. However, you must remember that customization takes time. When we customize a box for you it will take longer due to the design and type of box it is. 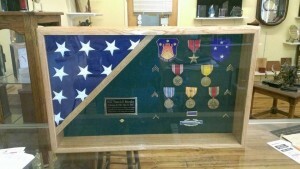 Simple modifications to our current shadow boxes we already build take less time but will still take longer than normal. Here is an example of one of our more recent modifications. 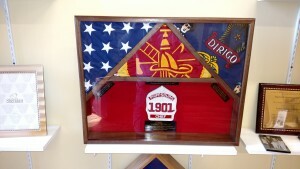 Our customer wanted a Tri-flag Shadow box, so we modified one of our standard 28″ x 20″ shadow boxes. To make it work we needed to make it so the 3rd flag would fit in the center. I order to do this, we needed to narrow the overall width of the box by about 3 inches so we would have 3 complete triangles. I am contemplating offering this shadow box for sale on our site, but I haven’t had much call for a Tri-Flag Shadow box yet. High School winter sports seasons are winding down and now is the time to be thinking of your MVP and Most Improved Player Awards. We at Basement Woodworks Inc. & Accolades Awards and Trophies are Midcoast Maine’s premier provider in athletic recognition awards. From plaques and trophies to Acrylics and personalized gifts, we are ready to serve your Awards needs. Stop in and see us or drop us an email and tell us what you need. It’s a well known fact that that majority of military retirements happen in the spring. Everyone tries to coordinate their house hunting leave, Terminal leave, and job hunting time off so if they are going to move, they don’t have to interrupt their children’s school year. Therefore most retirements are planned for the spring and early summer. With that said , you need to think ahead and get your shadow box ordered as early as possible so it will be there on time. Don’t wait till the last minute. This will be a lasting memento of your service to our country that will get passed down from one generation to the next. You owe it to yourself to have it done and done right. Hear at Basement Woodworks, we are here to serve you and ensure your retirement ceremony is one to remember, so order early and welcome to retirement. New addition to our insignia collection. 24 inch wood Aviation Machinist’s Mate wings. These wings were stained in a dual tone walnut and maple stains as per customers request. We will now offer these wings on our website for $62.99 in a single stain finish. Add $10 more for dual tone finish as shown. Be looking for Aviation Ordnance wings soon. Many people have asked about them and I am working on two different sets right now. In the mean time enjoy our website, there will be more to come. Spring retirements are just around the corner. 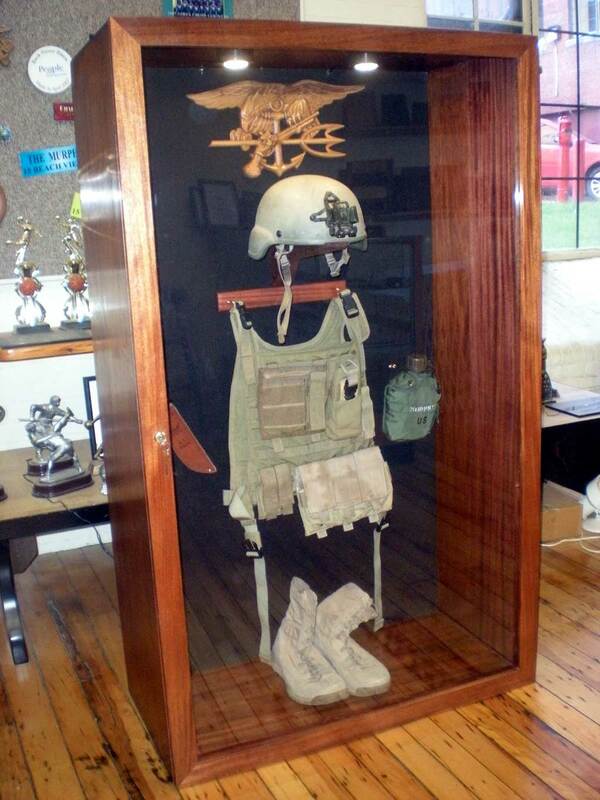 Don’t wait till the last minute to order your Military Shadow Box. Try to stay at least 6 weeks ahead of the power curve, so order early. Here is one of our least expensive shadow boxes. 15″x24″ (oak) for approximately $85. As you can see there is ample room for you awards and this case can be mounted on a wall or stand alone. Check out our website to see what we have to offer. For those of you who have not seen the movie “Lone Survivor” it is a Must See Movie. It is a movie about the men who were killed, and the one who survived “Operation Red Wing”. As I watched the movie, I had chills run up my spine for the second time about this operation. The first time was a little over a year ago when I was approached by the the crew of the USS Michael Murphy to build a shadow cabinet to house LT Murphy’s personal belongings. This case was to be affixed to the ship that is now his namesake. 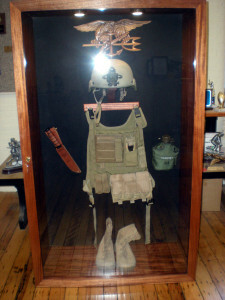 The crew brought in a cardboard box containing LT Murphy’s web gear, K-Bar, Canteen, Helmet, Boots and some other odds and ends. My hands trembled as I opened it and my only though was of the man who once wore these items and what he must have gone through. I was honored that I was chosen to build this case. Once I had completed the case and dressed it with his belongings, I turned on the lights and sat back a looked at what I had done. I was awestruck, and very proud of what I had done. Then a chill went up my spine, as if he were there in the room with me. I can only hope he had liked what I had done for him and the ship that bares his name. Here are pictures of the case that I took that day. Rest in Peace LT Murphy. Rest in Peace. 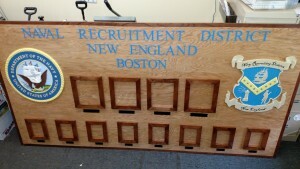 Case For LT Murphy Built By Basement Woodworks Inc.